Film history isn’t a highlight reel of universally agreed-upon classics. It’s an epic story. But some chapters of the story draw more attention than others. Secret Cinema is a column dedicated to shining a light on compelling, little-noticed, overlooked, or faded-from-memory movies from years past. Let’s talk about the films nobody’s talking about. 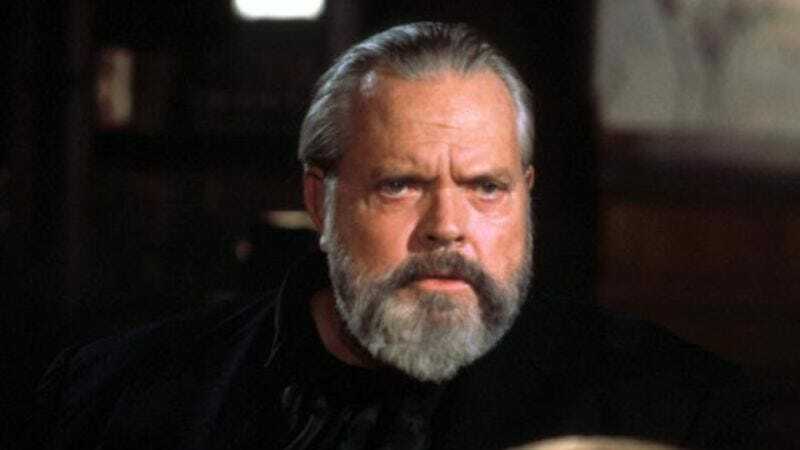 There’s an infamous audiotape featuring outtakes of a recording session in which Orson Welles attempts to supply voiceover for Findus, a European frozen foods company, but the words keep getting in the way. “We know a remote farm in Lincolnshire, where Mrs. Buckley lives,” he begins. “Every July, peas grow there.” He gets no further, expressing his distaste for the material and the way the words don’t sync up with the images of a snow-covered field in the way Welles think they should. But even without that problem, the way he reads “peas grow there” emphasizes the banality of the copy and suggests he knows just how unworthy the material is of his talents. “In [the] depths of your ignorance, what is it you want?” Welles asks, as the session gets more heated. One of the most-seen indignities of Welles’ late career, the VHS-era favorite The Man Who Saw Tomorrow finds the legend in full frozen-peas mode as he hosts a documentary on Nostradamus, the 16th-century apothecary and self-styled occultist whose poetic prophecies made him famous in his day, and famous in such a way that he’s never really stopped being famous since. The film, directed by Robert Guenette, makes it easy to see why. Nostradamus wrote four-line poems collected in batches of 100 and filled with vague, imagistic predictions that could mean just about anything. Or, put another way, they could mean exactly what readers needed them to mean. A line, for instance, about “a great swarm of bees” could be retrofitted to be about the bees Napoleon used on his coat of arms. In fact, once you start thinking about it that way, what else could it be about? And once you find a few verses of Nostradamus that look like they predicted the future, it’s just a small step to believing everything he wrote did predict the future. His own vagueness, human susceptibility to that sort of thinking, and the way both elements allow each age to apply Nostradamus’ writing to the times at hand have made his prophecies an endlessly renewable resource. Again, it might not be true, but there are scores of scholars—independent scholars—out there saying this, so we may as well repeat what they’re saying. And what’s to come? Well, in the film’s reading of Nostradamus—portrayed, like the rest of the film, though low-budget dramatizations, stock footage, and clips from old movies, a template taken up in later decades by budget-minded cable documentaries—we can look for Ted Kennedy to become president in 1984. It’ll be a rough job, though, since in 1986 there will be drought and a cannibalism-inducing famine. And then in 1999, a ruler in the Middle East will attack New York. That last one gives pause, doesn’t it? It’s awfully close to 9/11, which occurred just a few years later. But to buy it means to ignore all the inconvenient surrounding details. The film, for one, predicts a nuclear attack from the leader of a Middle Eastern country aligned with Russia. And yet—given that a Middle Eastern ruler, of a sort, did attack New York two years later—only the hardest of hardened skeptics could fail to think at least for a second that maybe there was something to it. Maybe. And it’s that kind of thinking that allows self-declared prophets to work. The once-ubiquitous Jeane Dixon, who appears in the film, became famous because she declared that whoever was elected in 1960 might be assassinated or die in office his first or second term. She made her career ghoulishly profiting from the Kennedy assassination, despite being wrong about almost everything else (and despite that prediction being pretty vague in the first place). Mathematician John Allen Paulos coined the term “the Jeane Dixon effect” to account for the tendency of believers to latch onto a few accurate predictions while ignoring all the ones that didn’t pan out. It also explains why Nostradamus, Dixon, the 2012 crowd, the Celestine Prophecy people, the Bible Code proponents, and everyone else who claims to see the future can make a career of it. Welles might have had a grudging admiration for the nonsense. Squint and The Man Who Saw Tomorrow plays like a brain-damaged sequel to Welles’ great documentary/essay/sleight-of-hand trick/philosophical text F For Fake, his 1973 film about forgeries, con men, magicians, himself, Chartres cathedral, and the meaning of life on Earth. Nostradamus’ writing means only what those who believe in it want it to mean, but that’s not the same as being meaningless. Like its inspiration, The Man Who Saw Tomorrow has proven strangely venerable. I first saw it as an impressionable kid watching HBO at a friend’s house, and its cheap-but-scary images of nuclear destruction struck a chord for someone growing up in the midst of late-Cold War chilliness. I saw it again flipping channels as a teenager when NBC repackaged it as a news special during the Gulf War, slanting the footage in a way that suggested Saddam Hussein might be the Middle Eastern leader of the prophecies. (Charlton Heston replaced Welles as the host.) And though it never made it to DVD and now seems to live only on YouTube, The Man Who Saw Tomorrow had a third life in the fall of 2001. Under the words “Rentals Soar At Blockbuster, Other Video Stores”—surely the last time that was used as a headline—IMDB ran an item about rentals surging immediately following the September 11 attacks. Renters were apparently seeking, according to a quote in the Los Angeles Times, “anything where terrorists got the stuffing kicked out of them” and, yes, The Man Who Saw Tomorrow. The film never really went away, even as its predictions failed. (My colleague Noel Murray even remembers watching it in school, which is saddening.) It’s nonsense, but it’s designed to appeal to anyone curious and dreadful of what will happen next—everyone, in other words—and it’s potent nonsense that needs just a bit of authority to put it across. That makes Welles, who was able to convey authority no matter how badly his career fell apart and how distant his early glories started to look, the perfect host. He understands he’s peddling junk, but he’s awfully good at peddling—and, after all, it’s a much more memorable brand of junk than the peas from Mrs. Buckley’s Lincolnshire farm.